What is temporary table in SQL Server? How to create a temporary table? The syntax to create a local temporary table is similar to the syntax of a normal table. CREATE TABLE statement is used to create a temporary table but the table name (Maximum 116 characters) is prefixed with ‘#’ (single hash sign). Its scope is limited to session in which it is created. These are automatically deleted once the session that created the table has been closed. We can also drop temporary table explicitly using drop command similar to normal table. The existence of Local temp table is only to the current session of current user (current connection) or we can say to the current query window only. If we close the current query window where we created the local temporary table or open a new query window then it is not accessible and will give the error as: "Invalid object name". One cannot create another local temporary table with the same name in the same session. It will give an error as: "There is already an object named '#temp' in the database"
but table with the same name can be created from another session. To test, open new query window in sql server management studio and create a local temporary table there with the same name as previously created local temporary table. It will create a new temporary table for that session also. These tables are automatically destroyed at the end of the procedure or the session that created them. Global Temporary tables are visible to or available across all sessions and all users (all connections). The syntax to create a global temporary table is similar to the syntax of normal table. CREATE TABLE command is used to create a global temporary table but the table name (Maximum 116 characters) is prefixed with ‘##’ (double hash sign). Once created, it is available to all the users by any connection like a permanent table. A Global Temporary table is dropped automatically once all connections using it have been closed. Note: I am going to explain the creation of local temporary tables in the examples below. Similar is the way to create a global temporary table. We just need to use ## before global temporary table name instead of single # as we use in local temporary tables. First Way: Create a temporary table and insert data into it like normal table. Second Way: Using CREATE TABLE command and insert data into it from other existing table. To test, let’s first create a normal table and insert data into it. Now create a temporary table (#tbBooks) and insert data into it from the table (tbBooks) created above. --Insert selected columns from existing table into temporary table. Third Way: Directly create and insert data into temporary table from other existing table using SELECT INTO- FROM command. This way we don’t need to create a temporary table explicitly. It automatically creates the temporary table and inserts data into it. 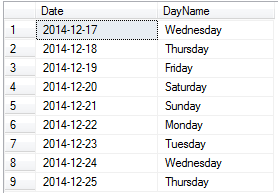 In above example we are using temporary table to store and get all the dates and their day name between two dates. 1. Temporary tables are alternative of table variables to store multiple result set. 2. Temporary tables can be defined as local or global temporary tables. 3. Local temporary tables are temporary tables that are available only to the session that created them. These tables are automatically destroyed at the end of the procedure or session that created them. 4. Global temporary tables are temporary tables that are available to all sessions and all the users. They are dropped automatically when the last session using the temporary table has completed. Both local temporary tables and global temporary tables are physical tables created within the tempdb database. 6. Temporary tables can be access in nested stored procedures. 7. Temporary Table can be truncated like normal table. 8. Temporary Table can be altered like normal table. 9. Temporary tables used in stored procedures cause more recompilations of the stored procedures than when table variables are used. 10. The data in the temporary table will be rolled back when a transaction is rolled back similar to normal table. PRIMARY KEY, UNIQUE, NULL, CHECK etc can be implemented at the time of creating temporary tables using CREATE TABLE statement or can be added after the table has been created. 12. FOREIGN KEY is not allowed in temporary table. 13. Temporary tables can be indexed even after creation. February 01, 2015 × This comment has been removed by a blog administrator.